The upcoming 62nd Tribal Art Auction on September 4, will have a special part regarding Tanzania - all exhibits of the former exhibition "Tansania - Glaube, Kult und Geisterwelt". Once again, you may expect a substantial offer of authentic old objects from Africa, America and Oceania. About 500 objects are shown in the catalogue with highlights from Gabon, Nigeria, Mali, the Ivory Coast, Congo and Indonesia. A special part is given to the region of East Africa, and here in particular to Tanzania. Some 200 objects, all exhibits of the former exhibition "Tansania - Glaube, Kult und Geisterwelt" could be acquired for this auction. The exhibits, shown in 2007/2008 in the "Kultur- und Stadthistorische Museum" of the City of Duisburg and once again in 2009 in the "Haus der Völker", Schwaz (Austria) were taken from the private collection Ralf Schulte-Bahrenberg, who died in January 2010. Ralf Schulte-Bahrenberg (1934-2010) was concert organizer of many domestic jazz festivals and co-organizer of Germany concerts of the Rolling Stones and Beatles. 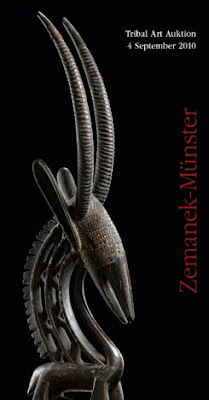 The Zemanek-Münster art auction house in Würzburg has been involved with African art since the beginning of the nineties and it has become Europe's only auction house that specializes exclusively in non-European art. The company started in 1978 as a small and distinguished antique shop for European art in Würzburg. Its first art auction was held seven years later, initially in rented rooms. In addition to their premises in Würzburg, Zemanek-Münster had been running art auctions for many years in Miltenberg (Frankfurt am Main) and following the reunification of Germany in 1989 in Dresden, the provincial capital of Saxony. In 1992 Zemanek-Münster moved into their premises in the Hörleingasse, Würzburg, an old blacksmith's shop in former times. In the summer of 2007 the auction house was renovated to provide more exhibition space and a new glass roof also considerably improved presentation. In 1990 Zemanek-Münster was already reacting to emerging changes on the arts market. In 1991 the company started to specialise in non-European art with the separation of the Africa collection belonging to the late artist and great collector Joachim Schlotterbeck, who died in 2007. The family run company today has eight full-time employees, who are art historians and ethnologists for European art and non-European art. The extended team also includes photographers, layouters and other enthusiastic employees. Their professional qualifications, academic application and the dedication with which auction catalogues are compiled have gained them a high degree of customer trust. The company is now widely regarded for its integrity, reliability and fairness in dealings with bidders and consignors all over the world. These constant high standards have led to the success of this small, family-run company at an international level. In addition, amicable relationships with both customers and employees and a warm and welcoming atmosphere all form part of the Zemanek-Münster company philosophy and have proved a decisive factor in the success of the art auction house. The future is also in safe hands: David Zemanek, the older son, who grew up surrounded by art and is a qualified art-ethnologist himself, will take over in the future.